More and more growers are saying goodbye to their fluorescent lights in exchange for the convenience of LED’s. LED lights use less electricity, last longer, and are more cost effective. They also use substantially less heat making them safer, and I’ve noticed I don’t get water spots on leaves. Here I will show you the results of lots of trial to show you how to grow plants with LED lights. Can you use regular led lights for grow lights? 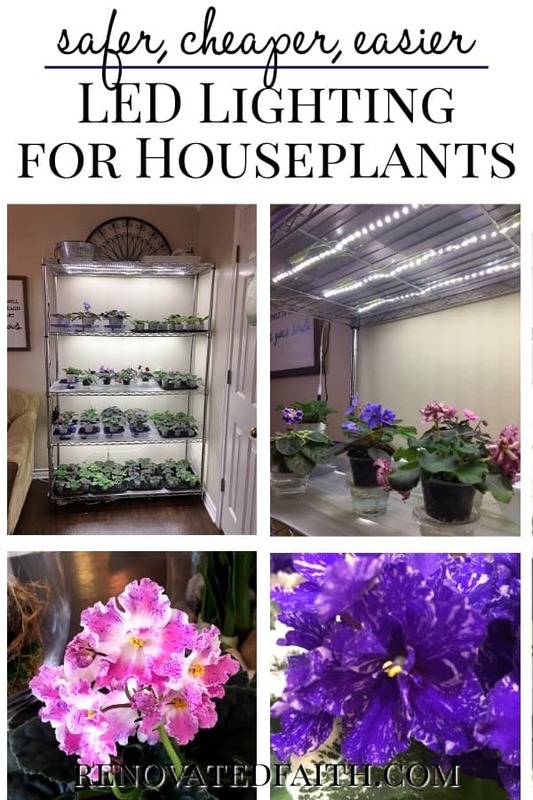 The traditional form of artificial lighting for African violets and other house plants are fluorescent bulb lights. Time and time again I’ve seen growers successfully grow plants without the use of specific grow light bulbs, but traditional fluorescent lights like you would buy at a big box store. Many growers prefer one cool bulb and one warm but other show growers have said they don’t think the color (Kelvin) affects plant growth a substantial amount. Therefore, one can assume that LED’s for plants don’t have to be “led grow lights” but can be traditional led lights. Also, using mainstream led lights is a much more economical option considering the high price of led grow light bulbs. What I like most about this setup is that my LED’s are dimmable. This allows you to customize the amount of light for each shelf depending on their specific needs. The dimmers also allow the lights to be closer to the plants. When I used fluorescent lighting on the same stand, I could only fit three shelves of plants as the plants had to be further away from the bulbs. 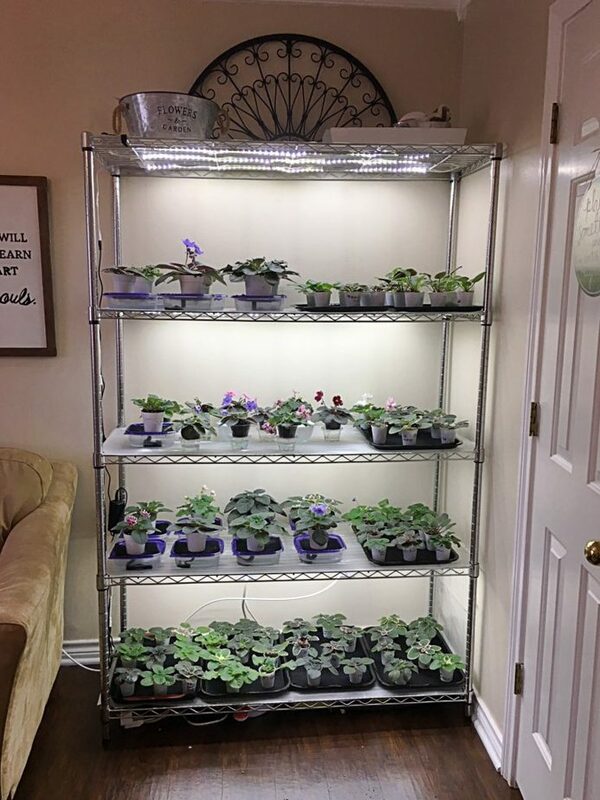 But now with my dimmable lights, they require less distance between shelves, which freed up room to add another whole shelf, which meant more plants coming in the mail! Led lights are also very gentle on plants as they don’t get as hot as fluorescent bulbs. I know of a successful hybridizer that uses led grow lights for seedlings so they are not subjected to the harsh heat of fluorescents. Starting seeds under led lights is not the only benefit. Another distinct advantage of LED lights is that they produce significantly less heat and are therefore safer for in-home use. LED lights are more expensive than fluorescent lights initially but in the long-term they are much cheaper as the LED’s don’t require regular bulb replacement. With fluorescent lighting, you have to replace the bulbs every 6 months to one year even if they don’t burn out because the light strength dims over time as the bulb ages. I’ve used the same LED light tape for over 2 years and my plants all seem very happy. All ages of plants are thriving and I’ll never go back to fluorescents. Some affiliate links are used in this post for your convenience. See my full disclosure HERE. Plant Stand – Click HERE for a similar shelf. LED Light Tape – Click HERE for my lighting. LED Dimmer – Click HERE. Power Supply Cord – Click HERE. Clear Gorilla Tape – Click HERE. Clear Shelf Liner – Click HERE. LED Connectors – Click HERE – YOU CAN USE THESE TO AVOID SOLDERING! In the link above are some differnet options. Just make sure they are 10mm connectors. Soldering Iron (optional)- Click HERE. Zip Ties (optional for holding wires in place) – Click HERE. Light Meter (optional) – Click HERE – There are also iPhone apps that you can use as a light meter. Here is a plant stand filled with younger plants. I have four, lighted shelves per stand each at varying light strengths. (I measure the light for each shelf with a light meter and each measurement is taken 6 inches below the light tape). My lights are on for 9-10 hours a day. This gives me a lot of flexibility to tailor the light needs of various plants. For example, I have several Russian and Ukrainian hybrids, which prefer cooler temperatures. As the floor is always the coolest part of any room, I put them on the bottom two shelves. Also, plants that need more variegation go to the bottom shelf. Lots of my Buckeyes and Cajun’s are on the second (330 fc) shelf as they need more light. If the crown of a plant on one of my 330 fc shelves looks tight, I move it to the end of that same shelf or to a 260 fc shelf. If a plant on the 260 fc shelf is reaching up, I send it to the middle of it’s current shelf or to a 330 fc shelf. This gives me a lot of options to ensure plants are getting the correct amount of light. What color lights do plants grow best in? The LED light tape I use is 6000K which is pretty cool in terms of color. I haven’t seen any negative effects and there is also warmer light tape if you want to alternate between cool and warm. You’ll notice the clear gorilla tape I’m using to attach my lights has a slightly yellow tinge which probably blocks some of the blue rays which probably isn’t a bad thing. 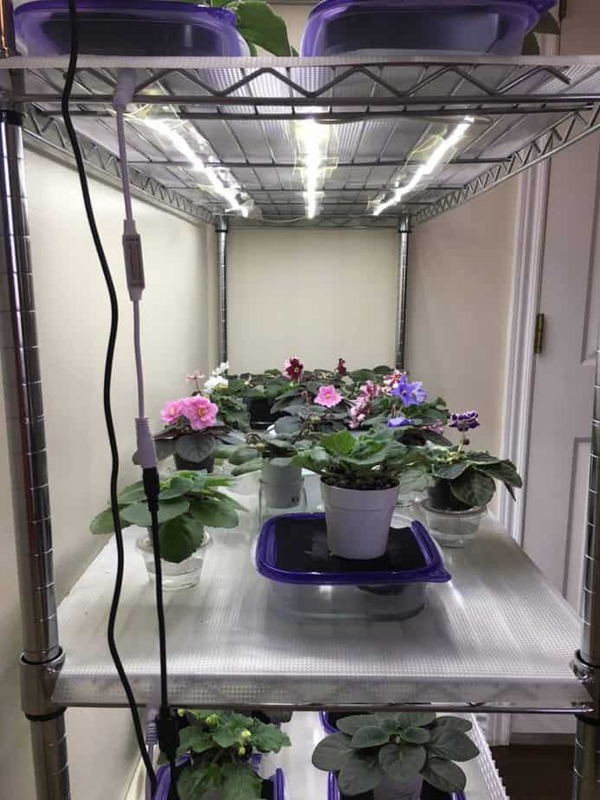 Using led lights for growing plants, you can customized the light color because light tape comes in different colors. You can check out a grow light spectrum chart HERE. What Kind of LED Lights Grow Plants? I use LED light tape which is sold on a long roll with an adhesive backing. On the tape, there are marks every couple inches where you can cut the tape to customize the length for your shelf. 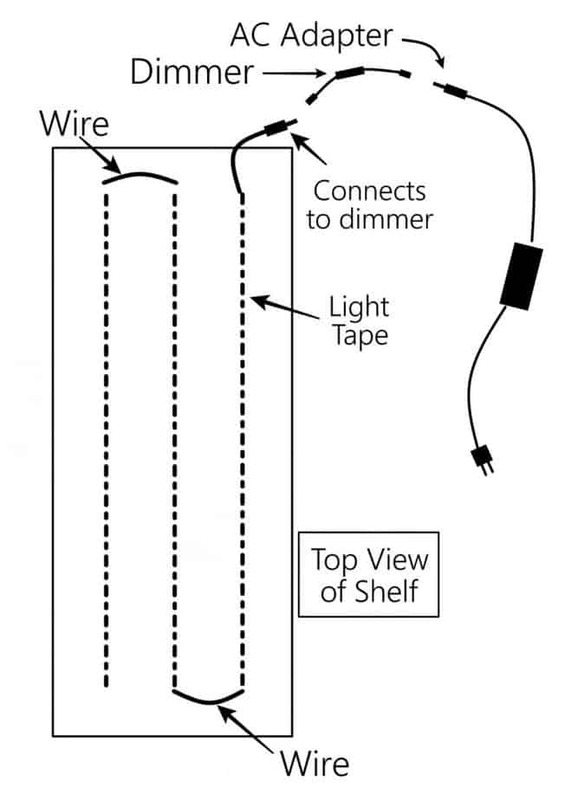 I cut the light strips to my desired length and planned for three strands of light per shelf about 4 inches apart. My dad taught me how to solder and I used old stereo wire to connect the strands at each end. (There are several YouTube videos like THIS one that show you how to solder – I promise, it’s easy!) IF YOU DON’T WANT TO SOLDER, YOU CAN GET THESE CONNECTORS. The end of each roll of light tape has an adapter which I connected to a dimmer. The dimmer comes with its own remote control to change the light level. The end of that dimmer cable then connects to an AC adapter, much like the power cord to your laptop. Each shelf has its own dimmer and power adapter. From there I put all 4 plugs into a power strip and connected that to my digital wall timer. You could have a couple different timers if you wanted to change the lighting duration for one shelf of show plants as you ramp up for a show. On each of my shelves, I have transparent non-adhesive shelf liner. I simply taped the light tape to the underside of the shelf liner and between the wires with clear gorilla tape every 6 inches. They need a flat surface to adhere to. (The adhesive on the back of the lights is not very strong, which is why I used additional tape). Another option is to get 2-inch plastic window blind slats and cut them to your shelf length. Then, tape the lights to the slats and then use cable ties to attach the slats to the underside of each shelf. I wanted my lights to be completely flush to the bottom of the shelves because I like the fact that you can’t see the lights sticking out. My lights are on a timer and are set to 10 hours a day. This varies with your conditions and of course the light strength and distance from your plants. Experiment with your plants to see how they react to different light strengths but do not put the lights on full-strengths. 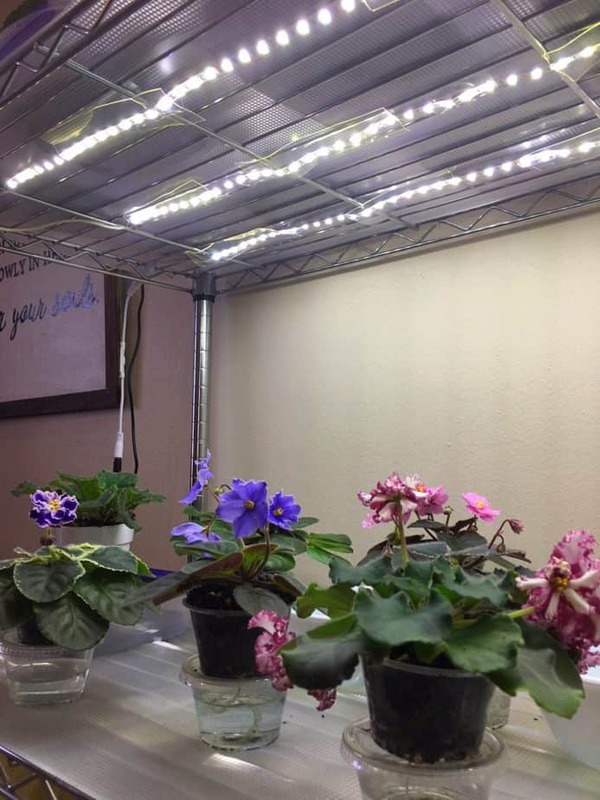 The dimmers are required to adjust the light because full-strength is too high for African violets. The tops of my plants are 10 inches from the lights. There’s only one negative I have found to horticultural led grow lights with a dimmer. Each dimmer has a separate remote that comes with it, but each remote affects all the dimmers equally. So, if I push the “On” button on one remote, not just one strand goes on, they all do. This can be a pain when I want to adjust the light intensity of one shelf. However, I just unplug the others first, adjust the light of the one shelf and re-plug the others in. Fortunately, I change my settings very seldomnly so this is not really a big issue. The cost to light my 4-shelf plant stand was just under $70 which included 4 power adapters, 4 dimmers and 2 spools of light tape. No matter the type of plant, led light strips are a fabulous options for growing indoors. I’d be happy to answer any questions you may have ([email protected]). The exact details to the lights, dimmers, power cords, tape and shelf liner found can be found under African violet supplies HERE. 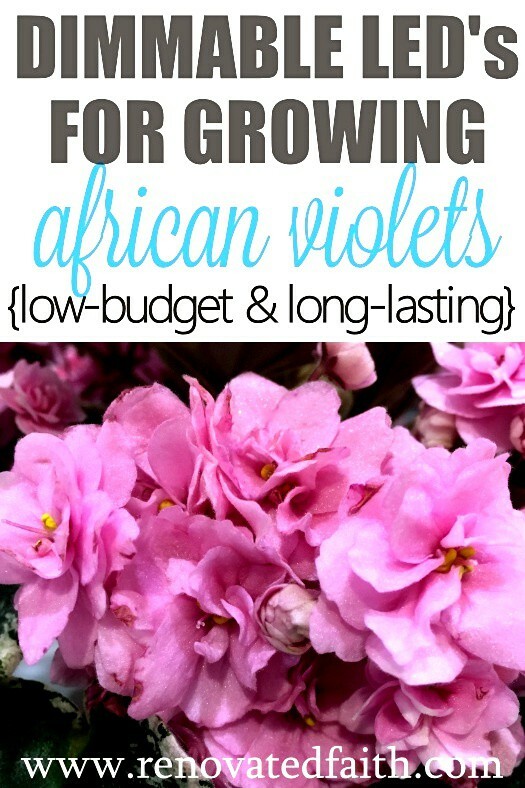 Hi, I am ordering the list of supplies for the African Violet shelves. Do I need four connectors, one for each shelf, if I don’t want to solder? I’m not sure. I would map out what you need for each shelf on paper first. If your lights do a “u-turn” you would need a connector there. Thanks! Did you used waterproof led strip lights? If so how did you solder it? Hey Susan, I added a link to a youtube video but if you don’t want to solder, you can use the connectors I have listed in the supplies list. Let me know if you have any other questions. Does the tape actually go over the lights? If so, the lights will not burn the tape? Hi Karin, I have a violet that the leaves turn dark around the edges. My other one doesn’t do that and they are next to each other, same size pot, same potting soil and same water schedule. What should I do? It does keep blooming. I was wondering what kind of timer you use. I’ve tried several different ones and some are difficult to program. I use the one listed in the supplies list in the post above. I currently have 6 of this same brand running on all my lights and I’ve never had one fail. Thanks for stopping by Judy! Karin, I just ordered the light meter you suggested. I’m confused on how to measure the light with this meter. There are three settings to select from, 2000, 20000, and 50000. Which one do you use to get your 260 and 330 fc readings? My LED lights have 3 brightness modes (1500, 3000, 5000 lm), right now I’m using the middle one, but not sure which one I should be using. I have the same light meter. Mostly you will use the middle setting and the meter shows the lux level which will need to be converted to foot candles. You can find a conversion chart online or divide the lux number on your meter by 10.764.